I have never experienced having gout, or a gout attack. But I can tell you there are enough pains and sufferings for those of us who are on dialysis, the end stage of renal disease. Like mentioned on www.madogre.com regarding gout, if you have never been hooked up to a machine that methodically circulates your blood for 3½-4 hours a day (three treatment sessions a week), then you may not have a realistic view of what someone on dialysis is experiencing. ** Physical pain – actual aches and pains within the body due to chronic kidney disease, and/or those sufferings that can be attributed to other medical concerns, such as heart disease, obesity, diabetes and hypertension, just to name a few. ** Mental pain – worries that painfully can affect the person’s mindset and, at times, cause ongoing stress and perhaps unending sleep apnea. ** Emotional pain – public episodes that might produce embarrassing reactions brought on by medical treatments, medicinal side effects, or blood pressure and/or blood sugar readings that are out of balance. ** Financial pain – dollars & cents matters that painfully can affect the pocketbook. ** Family pain – circumstances that painfully can affect not only the person on dialysis but oftentimes the relationships with family members, extended relatives, neighbors and friends. ** Religious pain – Sometimes, as a result of intertwined pains and extended sufferings, patients on dialysis might reach a low point of questioning their faith, whether it be Bahá’í Faith, Buddhism, Christianity, Hinduism, Islam or many other religions of the world. In experiencing the sufferings associated with dialysis, I can vouch for such pains in most every category listed above. Physical sufferings on my part really had begun several weeks ahead of being placed on dialysis. A sudden, unexpected weight gain had put me over 200 pounds on the bathroom scales, and suddenly the smothering of internal organs (heart, lung, etc.) due to excess fluid had created a lack of stamina and a shortness of breath, both accompanied with an element of pain and suffering. The stamina and breathing issues came to a climax in January of 2017, when my wife Maureen and I returned home from a weekend in Florida to watch three grandchildren play youth basketball on a Saturday afternoon, and to visit with daughter Sara and her family in Jacksonville. While it was fun watching the three games, it was burdensome for me to sit at length on the aluminum bleachers; at times I would stand up and lean on a structure pole within view of the court. The next day we returned to Indianapolis on a 90-minute flight. I had trouble exiting the chute from the plane into the terminal and required a wheel chair to reach our ride parked at the airport curb. After starting dialysis treatments on February 1 of 2017, I soon learned about the possibility of cramping up during the process. While only slight, the cramping in my feet and calf areas was quite painful and generally eased by the attending technicians in short order. Mostly, leg cramps while on dialysis result from the following conditions: 1. When blood pressure is lowered quickly, 2. Due to rapid sodium removal, 3. The appearance as a clinical manifestation of low potassium level, and/or 4. Inaccurate fluid removal goal established prior to the start of a treatment session. When cramping occurs, nurses and technicians can make adjustments that likely will alleviate the pain and the session can continue through completion. If the adjustments do not stop the cramping, then the dialysis process can be halted prematurely. My second week on dialysis brought about what developed for a neophyte dialysis patient into a catastrophic and somewhat traumatic experience. Certainly, it was not what you would call a “warm welcome” to a new lifestyle. On the Monday session, I began feeling quite colder as the treatment went on, despite sitting in a heated chair and wrapped up in a sweater and two blankets. Eventually the chills began alternating with an occasional bout of profuse sweating. I left the treatment center, went straight home and immediately sprawled out on the living room couch covered by a blanket. I stayed there until sometime in the night when I moved upstairs to another sofa, where I remained for all of Tuesday and until the time to return to the dialysis center for the Wednesday treatment. That mid-week hook-up to the dialysis machine was not any more inviting than the one two days before. The chills prevailed once again, only this time noticeable shakes could be characterized more as uncontrollable tremors. About halfway through the treatment, my temperature reached 102 degrees; my wife was notified that it might be wise to take me to the hospital following treatment. However, before she arrived at the center, the temperature had climbed to 104, and clinic personnel already had summoned an ambulance, noticing that I was in a rather hallucinating state. At the hospital emergency room, I was diagnosed with sepsis and eventually admitted. The doctors determined that my access ports located high up on my right chest for facilitating dialysis were infected. I stayed in the hospital for about a week while antibiotics eliminated the sepsis and a new catheter connecting to the jugular vein was implanted once again. 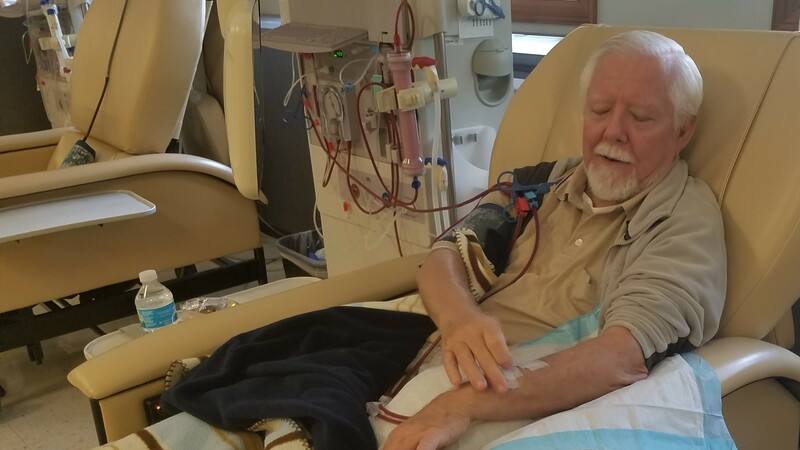 Needless to say, the introduction to dialysis to this point had already brought on some physical-type pains, not to mention the many painful thoughts that had an effect on my mindset, emotions and family considerations. There were those sleepless nights where thought processes were stressed out to the limit, emotions were challenged, and considerations as to how family members would adapt to the new lifestyle changes I was being forced to live. The most physical pain and suffering for me came in the second month (March) on dialysis when one of my new medications – Calcium Acetate, known as Phoslo – became quite problematic. One of its many side effects is constipation. Within two weeks, I met up with this big blue pill that is designed to prevent high blood phosphate levels in patients on dialysis due to severe kidney disease. The original dosage called for taking about 35 such pills weekly, and soon the prescription was upped to twice as many. I never got to increasing the dosage. It soon became quite evident that the pills would unleash the one side effect – that would provide me with some tales that should not be told at the dinner table. Early in my transition to dialysis, I began researching and writing a book that was published in late 2017 that was titled Dialing in on DI-AL-Y-SIS. Chapter 7 (GUESS WHAT NEW MONTH BLEW IN?) documents the two rather personal bouts with Phoslo, the first in my ground-floor bathroom at my condo and the other at the Emergency Room at Community Hospital South. Soon thereafter, my nephrologist dropped that medication from my pillbox list. Note: Those wanting to read the entire details of Chapter 7, or might be curious about the other 15 chapters of the 174-page book, the quality paperback is available online at www.diodialysis.com or at www.amazon.com. There was one evening during the early weeks of my being on dialysis that my wife was out of town and unable to pick me up after my treatment. At that time, my dialysis sessions were late in the afternoon. Good friend Jerry Lantz stepped up to handle chauffeur duties, and we planned on eating out. When he pulled up to the pick-up site next to the center’s main entrance, I walked out and got into the passenger seat. He pulled out of the drive and while entering Madison Avenue on the south side of Indianapolis, he asked me where I wanted to eat. I started to reply, but somehow, painfully, I couldn’t reply. What an embarrassing moment and more. I knew where I wanted to go eat, but I couldn’t get it out. My lips and mouth were moving, but I just couldn’t get my voice to work. Jerry quickly noticed I was having a major problem with my speech and suggested we get something to go so I wouldn’t have to get out of his vehicle. We settled on a Subway sandwich shop, and with some prying he got the word “tuna” out of me. We went on to my condo where I was still having difficulty with my speech and began eating our sandwiches. In 20 minutes or so my speech slowly returned to somewhat normal and my son Evin showed up to stay the night with me. That would wind up being an account that I can definitely document as having suffered an embarrassment. Some public episodes have been more embarrassing. I have over the years passed out due to equilibrium issues on several occasions – once conveniently at a funeral home showing, another time at my urologist’s office, and again at a Bob Evans restaurant in New Castle while in between games at the annual boys’ basketball holiday classic. The latter experience was quite painful; when I woke up I was lying on the restaurant floor exchanging stares with eaters while I was being loaded onto an ambulance gurney for treatment in the parking lot. After being tested for blood pressure and blood sugar readings and invited to be taken to a New Castle hospital, I decided to return to the restaurant to eat the lunch that I had already ordered. I also went back to the country’s largest high school gym for the night-time game. For many, if not most, end stage renal disease patients begin their journey on dialysis in a mental state of denial. “Why me? I really don’t believe this is happening.” It is at this point where some patients may begin to question their spiritual faith. I can admit that my mental state and my emotional being was being challenged. Before my initial dialysis treatment, I threw a one-night “pity party” with no invited guests. I spent an entire night tossing and turning in a hospital bed ahead of my first-ever time to be tethered to this rather imposing, blood-circulating machine, searching for a way out of doing something I truly totally didn’t understand and truly totally didn’t want to do. As the sun slowly prefaced a new day, the party came to a halt and I ended up doing what I truly totally did not want to do. That was more than a year ago. Since that beat-down by Phoslo, any pains and sufferings have subsided for the most part, thanks to a great extent to having completed the therapeutic exercise of researching and writing the book Dialing in on DI-AL-Y-SIS, documenting my experiences and overall perspective of being on dialysis. What bothers me now more than anything is directly witnessing three days each week the ongoing pains and sufferings – whether it be physical, mental, emotional, financial, family or religious – that are endured by fellow patients. What my mind wrestles with almost daily is trying to transition a multi-faceted vision into a realistic and worthwhile project that will help alleviate some of these pains and sufferings. Stay tuned.